Today we have another great post by Sandy McCauley, the owner of I Love KNK.com! Sandy has been supporting cutter owners since 2005, when she wrote her first tutorials for the Wishblade and Craft Robo. Since that time, she has written user manuals for KNK USA and Graphtec GB, taught cutter owners at nation-wide KNK retreats, and made over 400 software videos. She answers tech support questions at various Facebook groups, Yahoo groups, and cutter forums. 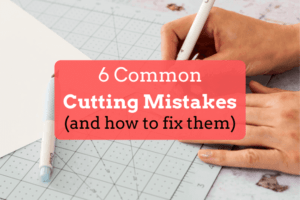 Sandy has helped so many people over the years and we are very happy to have her share 6 common mistakes made by cutter owners. *In case you missed it, Sandy previously wrote about 7 learning mistakes made by Cutter Owners. If you are cutting out a title, use a small letter as the test cut shape. If you are cutting out a rhinestone template, test cut a small pattern of, say, ten circles similar in size to what is used in the rhinestone design. If you’re cutting large simple shapes, you can use a basic shape like a circle, square, or a heart. I developed a troubleshooting flow chart for KNK owners to use in determining the best settings. 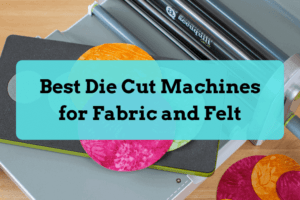 Since the basic principles behind successful cutting apply to all blade-based cutters, I recommend all owners check out this method of determining optimum settings. Details of this flow chart are found here. The most extreme example of “blaming the wrong thing” is when customers reinstall the software in an attempt to “fix a bad cut.” That is not the solution to a cutting problem! It might be the solution if the computer and cutter are not communicating although, even in that case, reinstalling the driver should be tried first. Stabilizing is the process of having some kind of backing to the material that is not penetrated by the blade. This backing keeps the material from being shifted by the blade and prevents cut pieces from “falling away” from the material as other parts of the project continue to be cut. Vinyl and many iron-on products already have a backing layer that is not penetrated by the blade and will serve as the stabilizer. Paper products, however, need to be stabilized by pressing onto a clean and sticky mat which also should not be penetrated by the blade, but only grazed by the tip. When someone contacts me with an issue where there are certain spots not cutting cleanly (refer to the photo above) I will first ask them to check the cutting mat closely, to see if the tackiness is missing in those particular spots. Often this happens exactly where the pinch rollers are traveling over the mat. But it can also just be a general loss of stickiness due to invisible material fibers collecting and interfering with the adhesion. Cutting mats can be washed with warm water and little bit of soap. This process allows these fibers to be absorbed by the water and rinsed away. The adhesive that is still on the mat will not be removed and, upon drying, the surface should be quite sticky again. But check the entire surface and add more repositionable adhesive to any spots that are no longer sticky. One can also use Goo Gone or Duck Adhesive remover to completely strip a mat and then apply a new thin coat of repositionable adhesive across the entire mat. This is a counter-intuitive issue that first arose with the Wishblade and Craft Robo cutters ten years ago. Users couldn’t understand why increasing the blade exposure (by changing a cap color on those blade holders) didn’t resolve the cutting problems they were having. The fact remains the same with all cutters: more blade isn’t going to provide better cutting. The amount of blade showing should be the thickness of the material plus just the least amount more possible. If you have a lot more blade exposed, not only are you unnecessarily cutting into the mat and dulling the blade, but you’re going to see more incidences of tearing, crumpled corners and incomplete cuts. When the blade tip extends into the mat, then upon lifting at the end of a path, it is more likely to pull the material away from the mat, thus unstabilizing it and possibly tearing it. Note: The new KNK Force is the exception to this “rule”. Because it has depth control, the blade can be fully extended but prevented from cutting into the mat. But this is currently the only cutter with Z-axis control in the hobby cutting market. Blades can get chipped if the blade holder is dropped or knocked against a hard surface. On high force machines, one can also chip a blade if too much blade is exposed, along with excessive force. The blade not only penetrates the material but is then pushed well into the mat, hitting the hard surface below. This being said, chipping doesn’t happen very often and shouldn’t be assumed when you suddenly get incomplete cuts. For one thing, most chipped blades will not cut a material at all, versus yielding a less-than-perfect cut. Thus, if your current settings are no longer yielding clean cuts, but the tips of the blade are still sharp, increase the force instead. Some of the time, blade offset will get falsely blamed for cutting issues. Other times, it is totally missed as the cause of rounded corners, bubbled corners, or hanging chads (cut shapes that are just barely still attached to the waste material where the blade starts and stops on that shape). So, take the time to understand what this setting does. Note that cutters with a limited range of blades will have the setting built into the firmware. But if you find this setting in your cutting software, then it’s important to understand it. If the blade offset is left at 0 and a medium or large shape is cut out, the shape will still be attached to the waste. The purpose of the blade offset is to instruct the blade to travel a small distance further to ensure the cut is complete. In this particular cut, either the cardstock shifted on the mat during the cut or the mat itself shifted. It was unrelated to the blade offset used. If you found any of this information helpful, please give us some feedback and share the Pinterest friendly infographic below! I hope this list has provided you with useful information to keep in mind. I welcome questions and feedback from all readers. Please post here or email me: sandy@iloveknk.com. I wish I had this article last year when I first bought my Zing. This puts the subject of blades and positioning for cutting into language I can understand. Thank you Sandy. You rock, Sandy. Your tips and insight are invaluable to people who use cutters. Thanks so much for sharing them. I read everything there is to be read about most of these machines. Your knowledge never ceases to amaze me. I had not heard or read to scan a blade for chips. It’s probably in print in your manual and I have read many parts of that. We all learn new things about these machines every day. Thanks so much for your findings! OK, now I understand “offset”, that’s a big help! 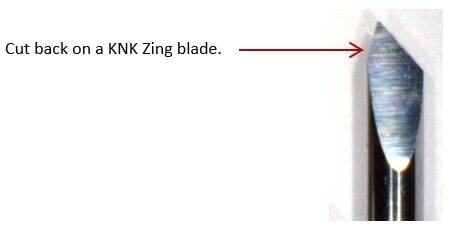 I have a knk force and during the cutting of an invitation, the blade is doing some random lines between an edge to another. I dont know why is this happening, can someone please help me.? ..Hi..Each and every time i cut the blade cuts some lines on top of the print when it moves to the next letter..what could be the problem..please help..
What does it mean when your machine is cutting and then goes off track and cuts below the area it’s supposed to cut. Hey Paulie, if you removed the material from the mat already, you can’t recut it. This is because it’s very difficult for the machine to cut in the same exact spot once you take it off and put it back on the mat. If you didn’t remove the stencil from the mat yet, you can do another pass. Glad you like your machine, what kind do you have? It will be off the second time around.